NATURAL RESOURCES: This wilderness encompasses the eroded hills, canyons and bajadas of the Scodie Mountains Unit within the Sequoia National Forest -- the southern extremity of the Sierra Nevada Mountains. A unique mixing of several different species of plants and animals occurs within the ecosystem transition between the Mojave Desert and Sierra Nevada Mountains. 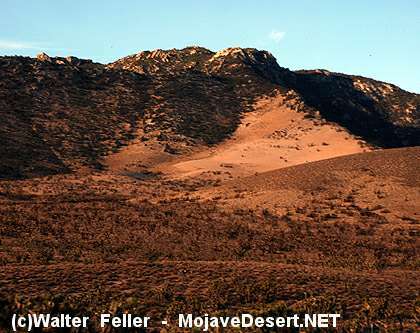 Desert plants such as creosote bush, Joshua tree, burro bush and shadescale may be found in close association with pinyon pine, juniper, canyon oak and digger/grey pine. The varied vegetation provides habitat for a great diversity of wildlife over a small geographic area. Species of note include raptors, the yellow-eared pocket mouse, a variety of lizards and a number of migrant and resident bird species. This wilderness is part of a National Cooperative Land and Wildlife Management Area and the BLM Jawbone Butterbredt Area of Critical Environmental Concern, which was designated to protect outstanding wildlife and Native American values. ACCESS: Access this wilderness from the north via Kelso Valley Road from State Highway 178 west of Inyokern; and from the east via State Highway 14 and numerous routes into Cow Heaven Canyon (SC5 1), Sage Canyon (SC56) and Horse Canyon (SC65), which are four-wheel drive only, and Bird Spring Pass Road (SC120).